Billy Lynn’s Long Halftime Walk takes place on a cold, rainy Thanksgiving Day at Texas Stadium, where the Dallas Cowboys are taking on the Chicago Bears in a game being televised nationally. Among the attendees at the game are the eight members of Bravo Squad, who are on leave from their posting in Iraq on a national victory tour celebrating their fight with insurgents, which was recorded by a Fox News crew and has turned the eight men into national heroes. The book is told mostly from the perspective of Billy Lynn, an 19-years old from a small town in Texas. Ben Fountain skewers all of the people who want a piece of Bravo for their own agendas, from the Hollywood producer trying to sell their story to the owner of the Cowboys who parades them around for his rich ticketholders and the pro footballers who want to hear about what it’s like to shoot someone but scoff at the idea of serving in the military. This is a rich, incisive, angry novel that spares no one in its cynical view of the military complex and America’s need for heroes and constant justification for war. Fountain’s writing is beautiful: descriptive, funny, poignant and (sometimes slyly) harsh on everyone who crosses his path (except for Billy). You won’t look at the military the same after reading Billy Lynn’s Long Halftime Walk. I really can’t recommend this book enough. In addition to being entertaining, it’s an important read. One passage that really stuck with me: Billy and a fellow Bravo are taken on a tour of the Cowboys’ equipment room, where they learn about the massive amount of gear needed for the football team to play one game. Billy says what we’re all thinking: do we devote the same amount of resources and attention to our soldiers in battle as we do for our professional athletes? 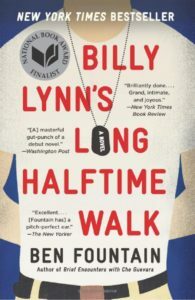 Billy Lynn’s Long Halftime Walk came out in 2012, but it’s just as relevant now. While writing this, I am also watching a baseball game on TV, and I just saw three gauzy commercials (insurance, insurance and insurance) featuring soldiers and vets. Our relationship with the military is as fraught as ever. This may explain why Billy Lynn’s Long Halftime Walk has been made into a movie coming out this fall (on Veteran’s Day, of course). I am a little concerned about this adaptation and am worried it will become Hollywood-ized and lose its potency and edge. Ang Lee, please prove me wrong. I listened to Billy Lynn’s Long Halftime Walk on audio, which was brilliantly narrated by Oliver Wymer. With the exception of the women’s voices, he simply nailed everything else, including sound effects, Texas accents, and Lynn’s own tentative voice. I highly recommend the audio. Posted on September 10, 2016 by gayle. This entry was posted in Audiobooks, Fiction and tagged ben fountain, billy lynn's long halftime walk. Bookmark the permalink. Should be required reading for all Americans. I’m about 75% through this book and feel the same way. It’s very different from the usual books I read – it’s very eye-opening about the treatment of our military and the excesses of our society. Great read. I loved this book as well and was struck by the exact same ‘football equipment’ passage. It really packed a punch. I’m hopeful Ang Lee will stick with the novel’s emotion and not turn it into a Hollywood trope!